There’s nothing more morning show like a product integration where a host awkwardly converses with a representative hawking the benefits of worthless tat. But today on Channel Nine’s Today program, we reached a new level. Interviews with cartoon characters. 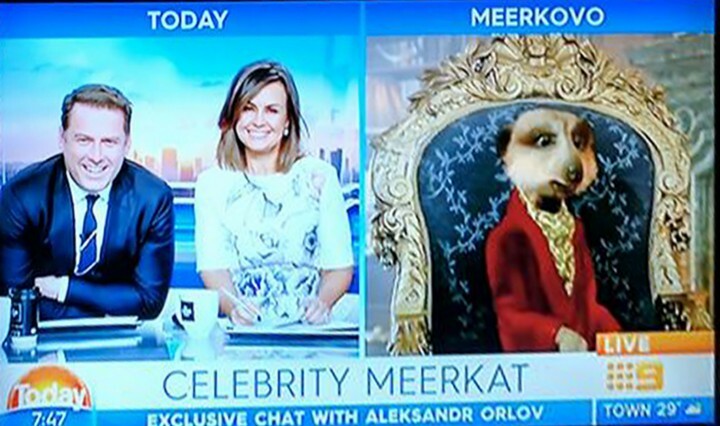 Aleksandr Orlov (who is, by the way, a meerkat… and fictional) appeared on the program to inform viewers that users of Compare the Market will receive a plush toy of either Orlov or his bumbling assistant Sergei when they purchase an insurance policy. Hosts Lisa Wilkinson and Karl Stefanovic then proceed to awkwardly ask Orlov questions, most of which were biographical followed by a stilted promotion for Compare the Market. The segment approaches the uncanny valley with a poorly lip-synced live performance, or even more damning, a poorly lip-synced prerecorded. It would be like if that live segment from that episode of The Simpsons where Homer answers audience questions went horribly wrong. All this segment achieved was insulting viewers’ intelligence. Although, this is breakfast TV we’re talking about and not something intellectually stimulating like Four Corners.